Jiddy Krishnamurti was an Avatar during the last century who embodied in mission to teach and spread messages of Light to mankind. In spite of his multiple health problems and the criticism he received, he is the twin soul of the Master Jesus inhabiting the spiritual plane 5.9. While he was embodied, he didn’t want to have followers or to be considered a guru as many other pseudo-teachers are considered nowadays, in that way he showed his humbleness to the world. As a Master of Light he came to serve mankind, but people did not understand him. Interlocutor: Who will come to talk now? Jiddu Krishnamurti: I would have to make a summary to call human beings “oddities” because the human being lives being reactivated. My name is Jiddu Krishnamurti. Interlocutor: The Well-known Jiddu Krishnamurti? Jiddu Krishnamurti: Correct. I have given an infinity of conferences, trying to unveil the mysteries of the mind, the mysteries of why the human being's big ambitions exist, about why the human being sometimes tends towards perfection and closer to achieve it, he goes back. There is a very important explanation. First: Every incarnated person is exposed, in a 100%, to the reactive mind. Second: The environment unfailingly restimulates the reactive mind of the person. Third: The incarnated human being, in all the cases, acknowledges receipt of the attacks of other reactive minds, restimulating in turn his reactive mind. Interlocutor: What you say is very clear, Master. Jiddu Krishnamurti: It is very difficult that an embodied person could stay at the edge of different situations. Even the most lucid minds, even the 99% analytical minds, they can go back in front of environmental onslaughts. Unfortunately, there are very few people that can stay depersonalized in front of them. On the other hand, the few incarnated people that stay unharmed, and with great difficulty, before these environmental attacks of nature, whatever they are, they belong to the planes 4 and 5 of spiritual vibration. There are things that should not be made. First, in my particular case I’m not incarnated; I am in the plane 5 of spiritual vibration and at the moment I am in mission in the plane 2. Interlocutor: If I’m not wrong, you never mentioned in your books the existence of the reactive mind and engrams. Is this true? Jiddu Krishnamurti: It is correct. Interlocutor: But was it because you didn't know that or because it was not your mission to make them known? Jiddu Krishnamurti: It was not my mission in that moment to make them known, since this mission was guided to the conferences that I have given throughout my life as a physical person. Interlocutor: There is some criticism that I have read somewhere, Master, I say it with all respect, in your conferences and in your books you went too much in psychology or something like that. Jiddu Krishnamurti: That was a bad interpretation. What I was looking for, and I’m still looking for, is the understanding of the spirit by the same spirit. The behavior, that part of ambition, that part of ego that all human being possesses, trying to integrate it into the whole of Love, the whole of sharing and very few times that can be achieved. Anyway it is very important to clarify this and I want to say it before giving place to other entities. First: all embodied person in mission should have to have his or her Thetan in the planes 4 and 5. For example: I’m at this moment in mission in the plane 2. Most of the incarnated beings ignore that the spirits can be in mission, not only when they are incarnated, but also in lower planes, mingling. Interlocutor: Are you somehow divided, I mean, part of your spirit is in the plane 5 and the other percentage in the plane 2? Jiddu Krishnamurti: It is very difficult to explain. Every human being, as you know, has 10% of his spirit inside of that shell which is the physical body. Let’s remember that each higher plane the vibration is subtler. For us, a vibration 2 or a vibration 3 are almost so dense as the physical plane 1. Interlocutor: I understand the idea. Jiddu Krishnamurti: To be understood. The word "flesh" belongs exclusively to the physical plane, so the "embodied" word would not make sense speaking in terms of the spirit and the spiritual planes. But it is like I’m not embodied but "represented" in the plane 2 in a camouflaged form, and there is 10% of my spirit in the plane 2, as if it were an incarnation. Interlocutor: The concept is clear. Could you express symbolically that your Spirit of the plane 5, did "embody" – expressing it between quotation marks- in mission in the plane 2 since in fact only one embodies in the physical plane? Jiddu Krishnamurti: Yes, with that explanation that would be correct. The spirits of the plane 2 believe that I am in the plane 2. Interlocutor: That’s very clear. Now I wanted to ask you if it was certain, as it was said in some esoteric circles that you would be the new Messiah. Jiddu Krishnamurti: It is very audacious, very risky, on my behalf to admit something like that. I know that there were people of my environment that considered that my messages were advanced to that time, as previously those messages of Jesus of Nazareth were. I humbly believe that I have transmitted many things, maybe some things not so concrete and other yes. My physical part left a lot to be desired. During more than 30 years of my incarnated life I have suffered from tremendous headaches. I have studied my unconscious somehow, discovering that I didn't bring traumas or problems, since I had come in mission, and the few setbacks that I could have gone through in my childhood, they were small things without importance. Therefore, the headaches were physical, real, for a problem evidently of brain circulation and nothing else. During many years they were gone and then during several years they returned. Until the last day of mi incarnation I was not been able to defeat those pains. I sometimes woke up at small hours screaming. Interlocutor: Do you have some theory about the origin of those pains? Jiddu Krishnamurti: I don’t have a theory at this time. I would have to investigate more about this topic. I didn’t disembody a long time ago either. Perhaps entities of error that were attacking me psychically preventing me to think have possibly intervened. I say it because as a matter of chance I was looking for a truth, I was trying to change a paradigm of Psychology, I was trying to give a new law of Psychology, and I could not give it while I was incarnated. If I had been able to make a change, I would have changed all the laws of Psychology, it would have been something more similar to the Transpersonal psychology that other authors have developed. In the moment in which that little Light was really to come, I had so enormous pains that sometimes I even kneeled down oppressed by the suffering. Interlocutor: Master, Isn’t possible that those entities of error were attacking you exactly in some specific engram? It is also possible that that bad circulation which you referred to was probable caused by an engram of your childhood? Jiddu Krishnamurti: Once I disembodied, I have traveled through the memory of the universal files - the Akashic records-, all the childhood of my last incarnation and there was not a fact of that nature. Evidently there was no such thing that now you call engram. There wasn’t. I attribute it rather to psychic attacks that prevented me to develop that new spiritual instance to change the current Psychoanalysis. On the other hand, I must notice that there were many Entities that were in mission in the plane 2 who asked to embody later on, and there was a kind of a transmutation, 10% went to the plane 2, and 90% to the plane 5. Then, it is not that 10% went to plane 1 and 90% to the plane 5. As I was in semi mission in the plane 2, 80% was left in the plane 5, 10% in the plane 2 and 10% in the plane 1. Do you understand what I mean? Jiddu Krishnamurti: When that spirit goes to mission in the plane 1, it is so destabilized, for that part that stays in the plane 2 that the spirit begins to make mistakes after mistakes in the plane 1, and the spirit decreases in Light intensity and it lowers to the plane 4 and then to the plane 3. Jiddu Krishnamurti: That is to say, it is very difficult, even for the most elevated Spirit of Light, to stay in double mission, in the planes 1 and 2. Therefore, I don't recommend it. I am giving what you would call a "class" on Earth, because many spirits of Light can make a mistake in their election. The fact that they have wisdom it doesn't mean that they are not fallible. We sometimes have the habit of thinking that all that we have around us is unalterable, it is certain, but it is not like that. To Conclude I want to speak about the incarnated part of Radael  and also about his disincarnated part. It is very difficult, sometimes, to achieve a clear mind. It is very difficult to achieve a total clarification of ideas, because it has been verified that even incarnated people whose Thetans are in the 5th plane of spiritual vibration, they end up reactivating their minds to such point that they create conflicts in their environment. That is unavoidable while the person has an environment. I’m not doing any kind of apology and I love that each person can have his or her family. But it is very difficult to make a mission embodied with an environment. Interlocutor: Do you mean a negative environment? Jiddu Krishnamurti: I refer to an environment of any nature. In my incarnated part I tried to be isolated from the greater amount possible of environment and that is known universally. I will give the example of the Master Jesus who said to his followers: “Do you want to know the Kingdom of Heaven? Leave everything behind! Don’t look back!" In that moment it seemed to be a very cruel sentence, since it was separating his followers from their families. However, this has not been in this way in a higher percentage, since Peter had his family, although he was practically very little time with them. Most of the time he was with the Master Jesus. Interlocutor: But isn’t there any karma to learn also with the family? Jiddu Krishnamurti: Anyway, the mission is more important than any particular karma. This was clarified very well by Buddhism Mahayana, where they explain that Bodhisattva - that is to say- he who voluntarily stops his evolution when he reaches an echelon below Buddha, it can be equally or more meritorious than the same Buddha, since he sacrifices his own sanctity to serve his neighbor. When they are about to reach the Path of Light, they leave that Path to serve. That is more altruistic, it is more venerable than sanctity itself. Jiddu Krishnamurti: Then, sometimes it’s valid to leave a family without the necessary help so that they can elevate their negative karma, when that estrangement is performed to pursue a mission that rises thousands of people and not only to few people. This is very difficult to understand for small or narrow-minded people. Keep in mind that the same brother Johnakan, in John Zebedee's incarnation, didn't have a family, he was always in Service. Did you know that he was practically the creator of hyperventilation? Jiddu Krishnamurti: In that time it was very common for certain Greeks and some nomads of the desert to harvest certain hallucinogenic plants and in big meetings they offered them, so much in smoke columns or herbal infusions with hot water, to create an altered state of consciousness where the person could see farther on. Jiddu Krishnamurti: John Zebedee has proven enough of that, but being already older, at the age of 60 years old, which was enough for that time. He began to work during a night he had a very high fever and he began to have visions and then, once he was cured, also with different herbs, he has experienced that state altering his breathing operation, accelerating it and oxygenating his mind so much that he ended up losing his ordinary sense of vision. Jiddu Krishnamurti: It was dangerous because he was not assisted. He did that in a cave, in Patmos, where he had the apocalyptic vision that was not understood until this day. I even demystify what many people say that the Apocalypse was written by disciples of John Zebedee, because it was not like that. Interlocutor: Does it have some connection with LSD that is to say, Lysergic acid diethylamide? Jiddu Krishnamurti: LSD alters in the same way that those herbs 2000 years ago, with the difference that the acid is a chemical product and it can produce irreversible sequels for the human mind. Then, it is not something advisable to be used on a daily basis. It can be used a couple of times as an experiment, but nothing else. Jiddu Krishnamurti: It is the same thing that the person that smokes a pot of marijuana. It is okay, he can reach an altered state of consciousness, but if that person is accustomed to that smoke, he can end up losing neurons and the sense of the incarnated intelligence. Interlocutor: In my case I don’t have clear-sightedness, Did I born with some blockade in this sense for some special reason or is there some engram that is impeding it? Jiddu Krishnamurti: Nobody is born with any blocked gift. It simply happens that sometimes, in certain incarnation, it didn't end up developing, and if it didn't end up developing it, is for some especial reason. It is always either to leave it to another therapist that makes it or due to one puts all his forces on a different aspect. I mean, there is no twisted explanation. The explanation is very simple. If in certain incarnation I cannot develop such gift, it is to be developed in another incarnation. Interlocutor: I understood the point perfectly. Jiddu Krishnamurti: Finally, I want to clarify something very important. We sometimes decide to embody in certain environment to learn certain karmic lessons we have to learn, or because in that environment there are too many conflicts and then it is a favorable environment to learn and evolve. But many times, even being in the 4th or 5th spiritual planes, "the eye extends throughout more than the arms." This is a very metaphoric sentence because in our plane there are no arms or eyes, but I want that all of you understand the meaning. I mean that sometimes decisions get out of hand. Maybe we embody in an environment where we think that we can learn, and the truth is that we learn because a wise man learns even with the conflicts, but many times that conflict which was seen from the plane 5 in a way, maybe benign, once incarnated it is worse than we imagined. Interlocutor: Could it be something like what has happened to me with the incarnation of Nero, where It wasn’t even foreseen that I were the emperor? Jiddu Krishnamurti: Correct, it has happened to you with the incarnation of Nero and even with other later incarnations. And not only happened in previous incarnations, but also it’s happening to you in this incarnation. But you are solving it in spite of the many setbacks you have had. And not only you, but also my vessel. Interlocutor: I don’t have any doubt. Jiddu Krishnamurti: I will leave you because another brother will communicate with you. I send my Light to all of you. Interlocutor: See you later, Master, and thank you. Who will communicate now? Johnakan Ur-El: I Am Johnakan Ur-El. I want to ratify the concepts of my brother Jiddu, with whom I have a great resonance, an almost so important resonance as the one I have with the Master Jesus. Jiddu is like a brother to me and we have exchanged in our plane many concepts. Many times, being in the plane 5, I have guided the Master Jiddu that was in the plane 2, and many times being I embodied in the plane 1; I have received spiritual assistance from him being in the plane 5. Our Thetans sometimes interact to assist each other. But I must confirm, regrettably that sometimes, even choosing from our spiritual plane where to embody, how to embody and in what family to embody, we sometimes see it much simpler from "above", and once we are embodied that simplicity becomes a problem and the same incarnation can destabilize us. It would be very selfish on my behalf to transmit a message of detachment, but I would be also hypocritical on my behalf if I ignore that most of the people that have been successful in an earthly missions, they have made it without an affective connection, without a mate and children. I’m not fomenting any kind of detachment, I repeat, but notice that as much my brother Jiddu as the Mother Teresa, and other Entities in the antiquity, they have been detached from affections, of family affections, of mate affections, of direct environmental affections. Most of the people were disengaged from those direct affections because they had a bigger commitment. Johnakan Ur-El: And it’s necessary that this be transcribed correctly: Sometimes one sacrifices intimate affective ties to go after universal affective ties. It’s of no use to have affective ties with a family of five individuals, if I close myself with them and I don't give a message to ten thousand or more people. This is very important to understand it correctly because I am not fomenting any kind of selfishness, I am not fomenting any kind of detachment, I am simply making noticeable a fact. If didn't make it noticed, knowing it, It would be hypocrisy on my behalf. I reiterate again, then, so that there is no misunderstanding that we are not fomenting any detachment, we are not making any apology to matrimonial separation of any person of the earthly universe. We are simply saying that in many cases the affective ties, instead of being tended toward the universalism are tended toward selfishness. Johnakan Ur-El: Sure, but the word was not "hate." I listened to my Master because I was with him when he spoke that sentence... He meant to he who doesn't untie from those affective ties. This was the spoken expression. This doesn't mean to stop loving mother, father or to stop loving the brothers. It means to love them, but in such way that that personal love does not hinder or prevents the impersonal Love to everybody. That is the Love that truly matters. In several circumstances - and that was previously mentioned by the Master Jesus and I have also made it noticeable in several occasions -, the Master was like -the word would not be "resentful", because that would speak of reactive mind, but he was like upset with his earthly mother Mary because she, in a petty selfishness, didn't want that her son have that mission and repetitively told him: "Son, you will end up hung, burnt or crucified." -Mother - Jesus responded to her- it is necessary that I fulfill my mission. This is translated literally. What happens is that they don’t know what was mentioned before. He needed to be detached from his family ties in order to be able to transmit the Word without any kind of interference. Interlocutor: Would it be the exact word "detachment?" Johnakan Ur-El: Of course! That word detachment was later on used by another soul in resonance with us, with the Master Jesus and me that is the brother Jiddu. 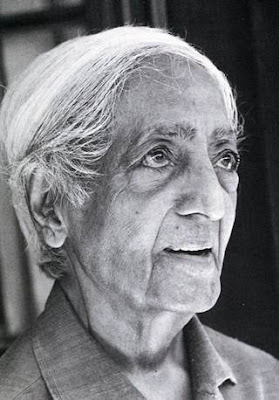 The brother Jiddu Krishnamurti who vibrates in resonance with us. I simply wanted to say this. I leave you with my blessings. Interlocutor: I thank you for your explanations. As you already know, your words are recorded and I will transcribe them and I will diffuse them opportunely. See you later. This entry was posted at Wednesday, February 17, 2010 and is filed under Who are they? . You can follow any responses to this entry through the .